Select Components > Legislation from the drop-down menu in the administration (back-end) of your web site, and then click on the AMENDING Sub Menu. 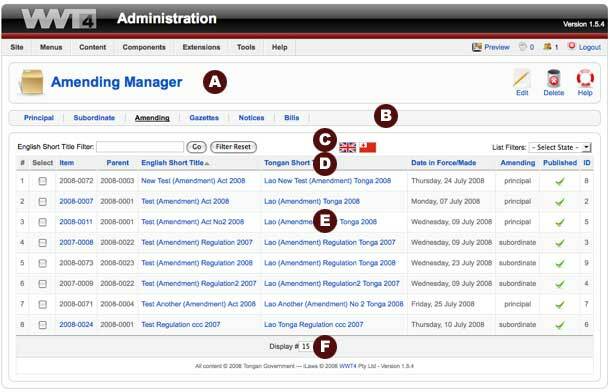 The Amending Manager is where you can edit existing Amending Legislation. 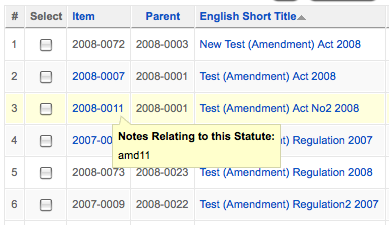 The default view displays AMENDING legislation in a list form. Depending on the site SETTINGS, either single or dual language SUBORDINATE legislation files are displayed. Edit. Click on this button to EDIT an item of legislation. The fields that can be edited are very limited as the integrity of the whole legislative process depends on the previously entered data being preserved. Normally in this screen the notes field is the only field that can be modified. At the top left, above the Filter, you will see the following menu links. Only items matching all selections will be displayed in the list section E.
Parent. The item number of the parent. Date Made/Superseded. Contains the commencement date. Amending. Contains the amending type (i.e. Principal or Subordinate). There are two types of Amending legislation. Amendments that change Principal Legislation or Subordinate Legislation.